Spending a few nights out there in the wilderness can be a fun and intriguing experience. But that is only true if you are going out there with a reliable tent. The ideal tent should be compact and lightweight enough not to be a problematic weight in your trip, but it should also be rugged and durable. You should also consider the size of a tent that you need. For one or two people, Big Agnes Copper Spur UL2 can be the answer you’ve been looking for. Big Agnes Copper Spur UL2 has successfully combined the lightweight design with luxurious features. Usually, a lightweight tent comes with little to no additional features in order to shave the precious ounces away from the total weight. But Big Agnes Copper Spur UL2 is quite the contrary. Big Agnes Copper Spur UL2 has proven that an ultra-lightweight can come with luxurious additional features, too. How is that even possible? Well, Big Agnes Copper Spur UL2 does this by using only the most advanced materials in the body, poles, and rain fly. These materials are the results of the modern researches and technologies aimed to produce lightweight yet incredibly rugged materials. At 4 pounds and 4 oz packed up, Big Agnes Copper Spur UL2 is not going to break anyone’s back. It also surprisingly packs up very small for such a sizable tent, requiring only minimal space inside your pack. The poles are made of high-grade DAC Featherlight aluminum, whereas the fly is made from a durable rip-stop nylon that is coated with the PU waterproof coating. When not using the rain fly, the mesh body enables you to fall into your sleep while enjoying the stars of the night sky, also to wake up seeing the beauty of the morning sunrise. The mesh does not continue all the way down to the ground; it is continued by a tan material that is also very breathable, yet highly durable to block most of the wind in a rainstorm. The tan part also functions to keep splashing of rain out of the tent. Despite the seemingly fragile body due to the lightweight design, Big Agnes Copper Spur UL2 is actually quite strong and stable. It does not get much of a problem even though the weather goes windy. The size of Big Agnes Copper Spur UL2 is suitable for two people. With two people design, there is still some room that you can use for storing your gear and bags, though not much. Some people also choose Big Agnes Copper Spur UL2 for going out alone because they need the extra space for putting their belongings – you can also take your beloved dog along inside. 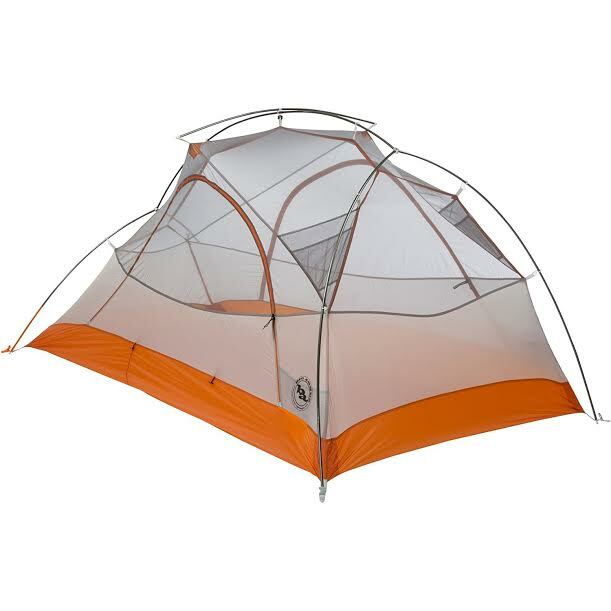 Check the best price of Big Agnes Copper Spur UL2 here!